We hope everyone had a wonderful Thanksgiving this year with friends and family. While most of the other Holidays seem to be so commercialized, Thanksgiving is still one Holiday when we can all get together and be thankful for who and what we have and not be so concerned with the presents we just opened or lamenting at the missed objects we desired but didn’t receive. I tell my kids each year, Thanksgiving is a day to be thankful for what you have, not to worry about what you don’t. If we worry about what we didn’t receive, whatever we have will never be enough. It will always be about what could have been, not what is. This week is a special week. Now, throw all that out the window on Black Friday. Of course they had to start Black Friday on Thanksgiving. I hope they don’t ruin that. I hope those that were out shopping early continued their Thanksgiving and ventured out with friends and family. Here in SW Florida we have more to be thankful for this year than in years past. Prices rebounded nicely up to $134,000. 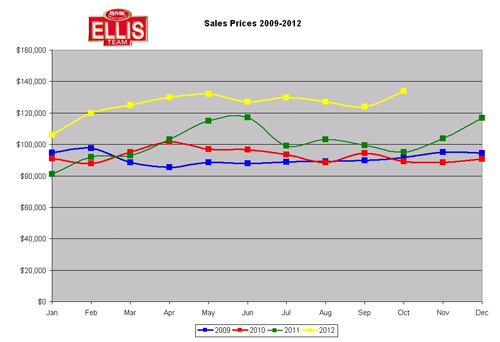 As you can see by the graph, prices typically start going up this time of year, and this year was no exception. It’s nice to know our market is continuing a positive trend. One of the other factors we like to look at is the mix of properties in various price ranges. For instance, in 2009 our median price bottomed because the low end firmed up, but that wasn’t the end of the story. The upper end had room to fall while the bottom was rising. We are seeing positive signs across all price ranges. We need look no further than the over $500,000 price range. Last October there were 24 traditional sales and 3 short sales over 500k. This year there was 33 traditional sales and 4 short sales. In the $200k-500k range there were 113 traditional sales and this year there were 187. Same goes for $100k-200k. The only price range that sales declined in was the under $100k range, but that’s because most of those properties increased in price and graduated into the over $100k range, another good sign. It’s getting very difficult to find anything under $100k, and one day we’ll be saying the same thing about $200k. This is all indicative of a recovering market. A few years ago we mentioned the market was healing and that it was a process, not an end. We had a lot of making up to do and forgiveness wasn’t going to happen overnight. Main Street is a little bit like Wall Street. A few stocks can move a market, but if trading volume is light the full breadth and scope of the market can be missed. We are beginning to see signs of strength with a wider breadth which indicates we are in full recovery. I’m not saying our market is completely healed. It is still a price sensitive market. There are some things that can still stall the market, both here and nationwide. However, this week isn’t a week to focus on what we don’t have. Thanksgiving week is the time to be thankful for what we do have, and we do have a recovering market with tons of opportunity. So let’s all sit back and savor. Inventory is rising a bit which is good, because we’re going to need it heading into season. Enjoy your leftovers this weekend. And with that I’ll leave a word of caution to buyers. The early bird gets the worm. If you see something you like, grab it. If you miss the main meal, you might be stuck with the leftovers. Leftovers can be good, but I’d rather have a crack at my first and second choices before they’re picked over. It’s just not as much fun settling for your 5th most favorite home when you could have had your #1. You’re not in competition with the seller; you’re in competition with others buyers. Consider this season a Black Friday sale. The first one in the door gets the first crack. Those that wait take their chances the shelves may run empty. Good luck and Happy House Hunting!!! !